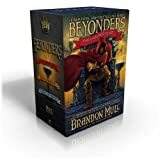 Don’t miss any of Jason’s thrilling adventures—get the complete paperback boxed set of the #1 New York Times bestselling Beyonders trilogy. Magic and danger abound in the second book in a series of “fanciful, action-packed adventure” (Publishers Weekly, starred review) from the #1 New York Times bestselling author of the Fablehaven and Beyonders series. Cole Randolph never meant to come to The Outskirts, but when his friends were kidnapped on Halloween he had to try and save them. Now he’s trapped in a world that lies between wakefulness and dreaming, reality and imagination, life and death. Cole’s hunt for his lost friends has led him to the kingdom of Elloweer. Accompanied by new friends Mira, Twitch, and Jace, Cole teams up with the resistance movement and joins the search for Mira’s sister Honor. But Elloweer has grown unstable. A mysterious enemy is wiping out towns, leaving no witnesses or survivors. And an infamous rebel known throughout the kingdom as the “Rogue Knight” is upsetting the balance of power. With enemies in pursuit, Cole and Mira must resort to a fascinating new kind of magic to protect themselves. Every move is filled with danger as Cole and his friends try to outwit the High King, who will stop at nothing to regain what he has lost. The #1 New York Times bestselling start to Brandon Mull’s new fantasy series is now available in paperback!